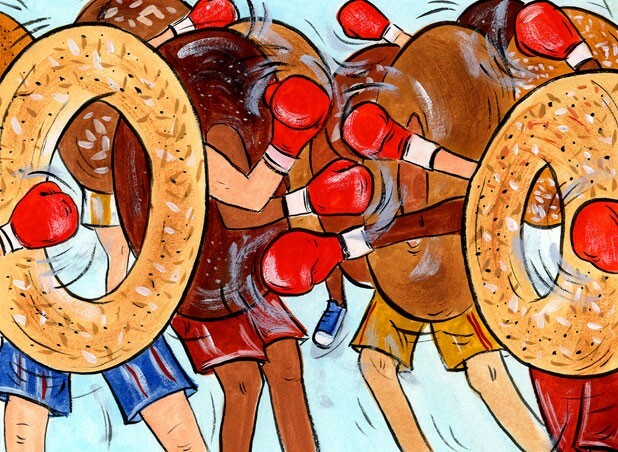 This year, the Burlington bagel scene entered a brave new world. With spring came two new, busy bagel bakeries — the Bagel Place in South Burlington and Feldman’s Bagels on Pine Street. 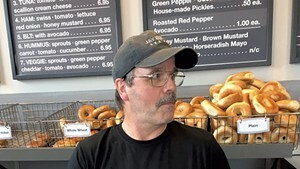 The latter marks the return to boiling and baking for Roy Feldman, a sort of grand poobah of local bagels: He founded Burlington Bagel Bakery in 1979 before taking a hiatus of a few decades. Feldman’s new location, inside a converted tire dealership, puts him within a long stone’s throw of local mainstay Myer’s Bagel Bakery, which brought in new partners this spring. Passions can run deep when it comes to preferred bagel styles, and here at Seven Days, where bagels are a dietary staple as we approach production deadlines, our staffers have strong preferences indeed. So, with new players on the scene, we decided to pit a few local bagels against one another in a taste test. Five staff members bravely volunteered to sample plain and everything bagels from the Bagel Place, Feldman’s, Myer’s, Burlington Bagel Bakery & Café (no longer owned by Feldman) and the new North End’s always-busy Bagel Café & Deli. To these we added an initially perplexing staff suggestion: the puffy bagels from Price Chopper on Shelburne Road. It wasn’t the most glamorous of tastings. As Rev. Diane Sullivan pointed out, a bagel without cream cheese is sad indeed. But we felt that each bagel should be evaluated on the merits of its dough alone, undressed and unadulterated by seductive cream cheese or toasting. So Diane joined circulation manager Steve Hadeka, associate arts editor Megan James, marketing and events coordinator Corey Grenier, and sales associate Sarah Cushman to blindly (and bravely) plow through an entire table of bagels. We judged each on looks, texture and taste. Was there a staff favorite? Yes, hands down. Here are our unscientific results. The skinny: Algis Shalna and his family opened South Burlington’s newest bagel shop last January. The bagels are made by Tom Roden, former owner of downtown Burlington’s the Mad Hatter, who steams rather than boils them. Flavor: Steve was impressed by the salt levels of both the plain and the everything bagels, declaring that everything bagels should include salt “by definition.” Diane and Megan also enjoyed these bagels’ saltiness, which Megan said was countered in the everything by “a nice bit of sweetness from the onion.” Sarah found them too savory and desired a bit more sweetness. Verdict: These giant puffballs of the bagel world use salt to their advantage. Toasted and slathered with cream cheese, would they become too saline? It’s worth a shot. The skinny: The bagels from this always-busy New North End staple are part of our weekly rotation at Seven Days, though not all of our testers could pick them out of the lineup. Eleven years of successful bagel making is impressive. Flavor: “Bland,” observed Sarah. Steve detected char. Like Steve, Diane admired “the good amount of everything” on the everything bagel. Verdict: These standbys are good-lookin’ and chewy, but rather flat in flavor on their own. Perhaps they’re ideal blank canvases for, say, the deli’s bacon-scallion cream cheese? Established: Staffers couldn’t tell us. The skinny: We included these supermarket bagels after a few hearty nominations from staffers. Appearance: Steve found the plain bagels “pale and dull, though the everything bagel had slightly better camouflage.” Diane called them “the bagels next door.” Megan found some pale and some burnt; they were “inconsistent,” Corey declared. They were also almost the largest of our samples. Texture: Like her fellow tasters, Sarah was not impressed with this bagel’s façade. However, inside lurked a surprise: “Very dense and moist,” she observed. “Nice, stretchy consistency and pleasing bite,” added Steve. Inside the “crispy outside,” Diane found “nice air bubbles,” though Megan was disappointed that these “deflated” when the bagel was torn. Verdict: As the cheapest of the bunch — right now, it’s “buy six, get six free” at Price Chopper — these pale bagels over-delivered. The skinny: This bakery marks the reappearance of Roy Feldman, who runs it with his daughter, Maddy. Texture: “Crust is chewy; inside is yum,” jotted Megan, combining her tactile and taste impressions. Diane: “Again, frighteningly perfect.” “This bagel is firing on all cylinders,” Steve marveled. Verdict: The hands-down staff favorite. The skinny: The oldest still-running Burlington bagel bakery turns out “hundreds and hundreds of bagels,” starting at 6 a.m. daily. Flavor: Observations ranged from “nothing” to “salty.” Megan found the onions on the everything bagel “very strong.” A good thing? Verdict: These bagels need a little TLC, but we wonder if they’re designed as bases for the creative cream cheeses and toppings that keep this café perpetually buzzing. The skinny: These are chewy, dense Montréal-style bagels. You love ’em or you hate ’em, but you usually recognize them from a mile away. Appearance: Steve observed that, given their distinct style, “there’s little point comparing these to the others.” Diane, who would ban Montréal-style bagels from Vermont if given the chance, called them “unattractive. Shriveled. The hole-to-bagel ratio is all out of whack.” Others found comfort in their familiar shape, though all agreed that the everything bagel suffered from a surfeit of poppy seeds. Texture: These dense bagels require “a bit of extra chewing,” said Sarah. “They are more fluffy than they look,” Corey pointed out. Flavor: Sarah thought these “pack a lot of flavor into their small size.” Megan called them “delicious” and found the plain bagel “honey sweet.” “Do I have to eat it?” Diane asked. Verdict: Bagels from Myer’s (and Montréal, for that matter) exist in their own universe. Despite the naysayers, if we didn’t bring them into the office on busy production days, there might be a riot. The original print version of this article was headlined "The Hole Truth"